Of all the mysteries in life, perhaps the greatest is the sleeveless holiday dress. A few weeks ago, I took Camber shopping for a Christmas dress and was hard pressed to find something in her size that wasn't strapless, sleeveless, or off the shoulder. A quick glance at the objects dangling from the hangers in the women's dress department at the mall revealed where girls' clothing designers get their inspiration. Sleeveless holiday dresses are great, if you happen to live along the equator. For all of us lucky souls who are fortunate to live in climates where the temperature hovers just above freezing throughout the month of December, the sleeveless dress is an open invitation for frostbite. In my house, it's also an invitation to employ one's resourcefulness in devising a way to make this year's specimen--a red and black plaid number--functional. My daughter's solution--a pink and yellow flower-print Easter sweater--was not my first choice, nor my second, third, fourth, fifth or sixth. Camber looked ridiculous in the sweater...but significantly less ridiculous, I reasoned, than walking around Philadelphia in the dead of winter without it. P.S. Some of you may be wondering why I didn't just buy a sweater to go over the sleeveless dress in the first place. I would have, if there were any to be found. The absence of costly and preferably bejeweled matching cover-ups for sleeveless dresses is yet another great and hitherto unsolved mystery of the modern world. Maybe you can help. AMEN. We live up in Erie, and we have between 6-120 inches of snow on the ground at any given moment from November on. WE can't get decent dresses with SLEEVES, or heaven forbid, matching sweaters. LOL. It's crazy! Same thing down here in Georgia where we don't get snow but who wears a sleeveless dress in December?? I thought the same thing when I went to buy the grandaughters a dress. Didn't buy one. Still looking. I'm kind of astounded by this anomaly as well. I really am irritated at whatever person decided no sleeves in the dead of winter was a good idea. How funny Jana-I just went to the same store your pictures were taken yesterday and the EXACT thoughts were going through my head! Although I did find a sweater online at Gap for $34.99 that would go great with her new sleeveless dress-but I could NOT bring myself to buy it for my daughter who gets holes in the back of her shirts, pants, backpack...need I continue? I agree, living in Northern Utah I have the same problem. I had to search, and it took a lot of searching, to find a cardigan sweater that was white and would look good with her Christmas dress. I was in a big-name baby store last night(you know the kind that sells babies?...well, not really) and was irritated to find the same problem. I ended up choosing to put my 5 month old in comfy baby pajamas for the family Christmas party(probably to the horror of my in-laws) over buying her a $25 scratchy, sleeveless, off-white (to match the spit up?) dress that needs to be dry cleaned. PLEASE. Most days, I look forward to hopefully one day being able to shop for little girl clothes . . . not so much today. Nope, today, I'm glad my three little boys will all be wearing some variation of the LDS primary standard outfit, which, coincidentally, is exactly like their daddy's church uniform. My word verification was cuckhore. And I just can't think of anything funnier to say than that. New reader. Love the blog. Well, it occurs to me that with a little hot wash and dryer-on-high-heat love, yesterday's giveaway sweater has the potential to become today's sleeveless dress cover-up for Camber! I've found this to be the case while shopping for my nieces, but you're in luck. Have you tried Burlington Coat Factory? I have had a very high success rate there and they are quite reasonable. Target has sweaters every year (Burlington too)...but that may also be because it's in happy valley and there's a demand. I feel your pain. I have the same problem finding a decent Christmas dress for Ceara. For God's sake, we live in Wisconsin, where sleeveless is appropriate for about 3 days out of the year! I did find a cute little black velvet shrug at Target this year. It striks me as odd that for boys, they have all these corduroy pants, sweaters, long sleeved dress shirts, etc. i agree. it makes no sense to have a velvet sleeveless dress. i buy sweater dresses for my daughter on Ebay. some of them come with cute matching tights. Thank you! I ask this same question every year at Christmas and Easter. I have taken to buying white cardigans whenever I find them on sale and putting them away for the next time my daughter needs one to accompany such a dress. I bought a red plaid dress sleeveless dress for my daughter this weekend. I found a black fitted sweater to go under it, it was jersey material and it looks perfect with the dress. You are so right! I don't understand it. Oh.....I SO understand! 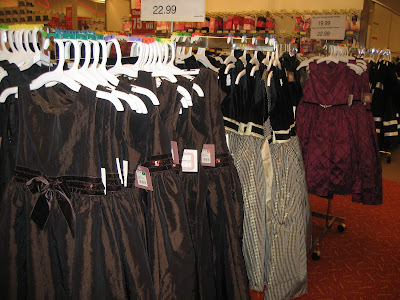 I just went shopping on Friday for my three girls and it was sleeveless dresses "as far as the eye can see!" I'm so glad to know that I'm not missing something! Same thing in NY, crazy. My mom made little jackets to over them, but why they make them sleeveless is beyond me. Those fashion guru purchaser types are ridiculous. Would they sell fur-lined swimming suits and wool flip-flops in the summer?! I hope they can sort this thing out before too long because I REALLY don't want to learn how to sew. 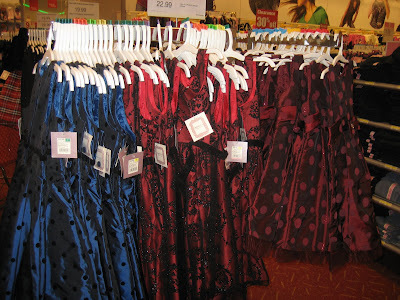 Okay, ran into Costco last night and they have tons of beautiful Christmas dresses WITH SLEEVES for around $20! It's a Christmas miracle! I have wondered the same thing except in Miami and Puerto Rico. Maybe the designers live there in the winter? Wow! It is amazing someone finally wrote what I was thinking. I just went through this same situation two weekends ago. I also feel like we are getting much less material than needed for Halloween costumes. I mean seriously, we need more than just a thin almost see through layer of material for our children to trick 'r' treat in. Come on we don't all live where it is hot and sunny all year round. I agree. Sleeveless dresses for Christmas don't make any sense. And it's very disturbing that so many girl's clothes are immodest, whether it's blatant or subtle. I've bought a few sleeveless dresses for myself that are perfect other than the fact that they don't have sleeves. I've found some cute little cardigans to go over them, but I wish so much that fashionable dresses with sleeves were a lot more common, for both girls and women.